The Escondido Union High School District (EUHSD) is pleased to announce the 2019 Teachers of the Year. These teachers are extraordinary educators and are deeply committed, hard-working, passionate and supportive to their students and our district. Their work and leadership in the classroom is key for our students’ successful path in life. We congratulate them and recognize them for their hard work and dedication! Becky McKinney started her career as a forensic scientist, but found her passion in teaching. Becky teaches Physics, AP Physics, and AP Biology and currently serves as PLC LEAD TOSA and Science TOSA at SPHS. Becky was an integral part of the district team that developed and implemented the NGSS curriculum for Biology, Physics, Chemistry, Earth Systems and more. She reaches out to teachers of all disciplines to learn from and share best practices, and supplies engaging lessons in all science content areas founded on real-life phenomena. Becky has been instrumental in mentoring and supporting new and veteran teachers. She finds time in her very demanding schedule to support new teachers with the very difficult job of starting out a new class. She empowers each teacher to engage students in NGSS to develop problem-solving skills to Becky McKinney prepare for future life opportunities. Becky’s model of delivery is something we all aspire to achieve. She empowers student-led learning opportunities of real world problems to help them discover content. She inspires and helps students advocate for their own learning. She makes science real and exciting and communicates her love of science with passion. Becky is also involved in many outside programs such as Robotics, MESA, “Dancing with the Teachers,” and many other activities. She was selected as the INCOSE “Outstanding Engineering Educator” of the year for 2018. Becky’s vivacious personality is a plus to the science department & to all of SPHS. Her professionalism, commitment to students, energetic personality and heart of gold have earned her the admiration of students, parents, community members and colleagues. Lania Padilla has taught for 9 years and joined DLA in 2016 as a Spanish teacher. In addition to Lania’s role as a classroom teacher, part of her professional growth comes in the form of her role as ASB Advisor at DLA. Lania joined her colleagues in creating a cohesive curriculum that would serve both groups of scholars, meet academic standards, and prepare them to continue pursuing advanced Spanish Language courses and meeting the Seal of Bi-literacy requirements. She routinely collaborates with her colleagues to ensure that scholar’s not only continue to emerge as bilingual, but most importantly, that they develop a strong sense of the history of the language as well as its cultural significance. She is well versed in the use of Restorative Practices for building and repairing relationships. This is evident in the collaborative culture within her classroom. As a teacher, Lania is nurturing and provides many scholars with a safe place and open door, demonstrating the “be the best” Pillar. She is an excellent communicator and approaches problems with a clear mind and a level head and communicates her ideas clearly. She works with colleagues and leadership to ensure the best interest of all scholars is at the center of decision-making. Lessons are designed to provide both whole group and small group interactions in order to meet the unique language needs of both native and target speakers. She immerses herself in the school’s culture and is viewed by scholars as a person who builds relationships. As ASB Advisor, she works alongside staff and scholars to help grow the school spirit and extracurricular options at DLA. An important note is that because of DLA’s unique schedule, the ASB meets after school and during lunch as a group. Lania is deeply committed to both her role as teacher and her role as ASB Director. She spends six weeks each spring (with her colleagues) visiting junior internships. Many scholars have come to rely on Mrs. Padilla as their trusted mentor and their connection to DLA’s culture. Lania mentors the scholars by helping them build organizational structures and skills to lead their respective clubs and foster a spirit of inclusiveness across campus. Recently, Lania and the DLA ASB organized a blood drive in recognition of a DLA scholar currently battling cancer. In this, and so many other ways, Lania demonstrates her commitment to DLA’s Core Values. Scholars and staff see her work tirelessly to impact the scholars’ school experience in a positive way. Lania represents DLA and the EUHSD community through her positive voice, endless energy and her desire to see scholars succeed. Alison Aardappel has taught English at Escondido High School for the past twelve years. She creates a classroom culture that is warm and inviting. Many students have shared wonderful stories about how helpful and kind she is in their English classes. Ali does an unbelievable job working with kids one on one, as well as preparing and delivering the daily lesson for the classroom. She is very passionate about student learning and strives to make each lesson motivating and understandable. She is constantly trying to improve her skills by asking questions and reflecting on her lessons. Ali is a leader on campus. Some of her responsibilities on campus include Camp Lead Counselor, ESTA site representative, Writing Club and Young Democrats of America Advisor, and Freshman Academy Lead. Ali was the English 9 PLC lead for four years and led her team into adopting Standards-Based grading. She is well respected by her co-workers and her dedication to the classroom is well documented. She was a part of the 2018-2019 Curriculum Adoption Team and is also a member of the Escondido High School Guiding Coalition, which includes all the leaders on cam pus. As a leader of the Freshman Loyal House, she reaches out to many teachers and students to make sure their first year at Escondido High School is a great experience. Alison Aardappel is an outstanding teacher who has received a few awards while at EHS including Teacher of the Month in September of 2017, and the 2018 Lighthouse Award. Her knowledge of English, dedication to students, and preparation for each day are excellent. Kristi Sovacool has worked for the district since 2009 as an exemplary Culinary Arts Teacher in our CTE department. In addition, she currently serves as our Department Chair for CTE, is site leader of our Equity Task Force and a charter member of OGHS’s Guiding Coalition. She is also extremely active in the local culinary arts community and she has introduced our students to a number of industry events via her contacts at local restaurants and culinary arts institutes. powerhouse at OGHS. Kristi often works nights and weekends to ensure her students have opportunities working on “real-world” culinary projects, such as catering events at the California Center for the Arts Escondido, taking a baking class at Cute Cakes on Grand Avenue, and participating in annual Master Chef competitions. Ms. Sovacool also acts as a tremendous ambassador for OGHS by hosting extraordinary Patriot Cafes, which allow community members to experience both the competency and grace of our students. She is extremely competent and kind and she is a greatly respected teacher leader. Ms. Letha Morrison has been a teacher for twelve years and has been at Valley High School for ten years. During her time at Valley High School she has taught English 9, Film as Lit, Connections, and was instrumental in our transition from English 12 to ERWC. Letha is always seeking ways to improve her craft. 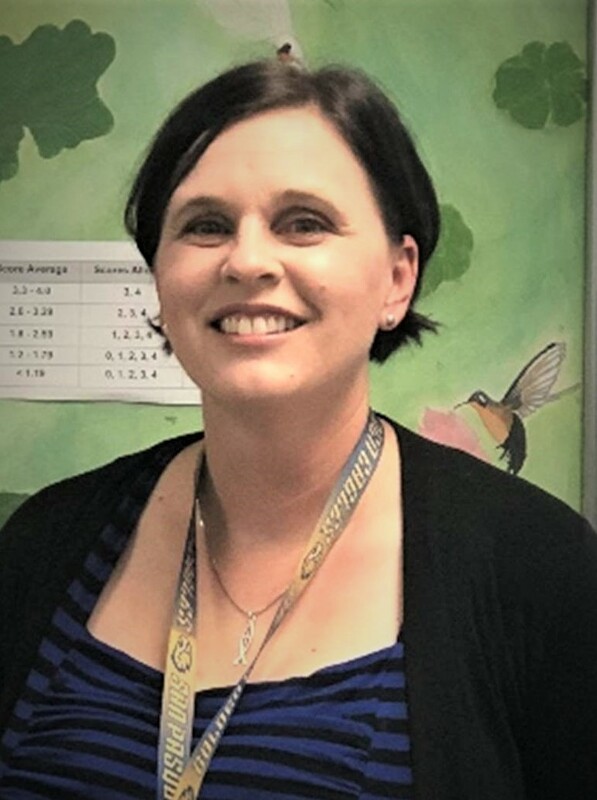 Letha Morrison is active in our school site PLC, School Site-Council, WASC writer/editor and this year has stepped up to take on the role of our Union Representative. She constantly strives to do what she can to make our school a productive and welcoming place for our students and staff. She is a team player and rarely says no. Letha has created a classroom space that is safe and nurturing for Valley High School students. She seeks to provide a learning experience that is new and interesting. Our students’ academic success is of high priority to Letha. Her room is open every day as a tutorial space for students from all content areas. She also works with graduating seniors every year on developing and practicing their speeches for graduation. students. She is empathetic to the struggles that some of our students are faced with and strives to find ways to make their days a little easier. She recognized that our kids needed an outlet for their artistic talent and started an Art Club on our campus. Her room is open every day for kids to come and paint, draw, do crafts, and sew. She displays their artwork proudly in her room and our school office and encourages kids to enter their artwork in contests. She works with our kids each year on building a float for the Escondido Jaycee’s Parade, which have won six trophies over the years. Besides opening her room for students, Letha has opened her heart. When she realized that many of our students felt unprepared for job interviews because they didn’t have anything to wear, she gathered dress shirts, ties, shoes, dresses, and pants that students could borrow for their interviews. Eventually the small area in her classroom was overflowing and she sought out a larger space, and our Valley Boutique was born. It is with great honor and pride that Letha Morrison has been selected as Valley High School’s Teacher of the Year. After obtaining his degree, Joshua Murphy gravitated towards Adult Education. Since joining the staff of Escondido Adult School in 2009, Josh has developed into an outstanding educator in our afternoon and evening high school diploma and high school equivalency program. In the diploma program, he is responsible for instruction and is required to be knowledgeable in over 20 subject areas. In the high school equivalency HiSET program he prepares his students in the five test areas of math, reading, writing, science, and social studies. Josh’s commitment to the school, his colleagues and students is unchallenged. His enthusiasm in the classroom and his ability to engage students and motivate them is remarkable. He also travels out two mornings a week to our site on the Rincon reservation to teach a hard-to-serve population there. He is also our CPR instructor on Saturday mornings and most recently encouraged and guided another staff member to become qualified as an instructor. Last week, Josh put his life saving skills to work through use of the AED and CPR. He is truly a lifesaver! Josh was the chair of the school’s WASC committee in 2016. He was commended by the chair of the visiting team for the work he had done. In recent months, Josh resumed his role as WASC chair for the Mid-Cycle report and has steered this process. Josh has been very active in CCAE, the California Council for Adult Education at the section level. He attends conferences regularly and was a valuable part of the planning committee for the 2014 state conference in San Diego and again for this years’ state conference in San Diego. Josh is responsible for ensuring the success of students through the District’s Edgenuity instructional program for high school diploma students. He demonstrates great empathy and skill for our adult students who have often had less than positive previous educational experiences.